This is my trusty Citizen Dual Time watch and as you can see, water went in while I was doing some washing over the weekend. This is not the first time that has happened. In fact, it has happened quite often in the past especially if I am playing golfing in the rain. Again, you do not need to take the watch apart coz if there is a way for the water to get in, there is a way for the water to get out. The following solution was taught to me by my caddie from several years back. All you have to do is turn the watch around. We normally wear the watch on the back of our forearm. Turning it around means moving such that the watch face is on the same side as your palm. I can't explain the scientific logic behind it, if any. I just know that it works. It's 3 hours since I took the above picture as I am typing this out. The water in the watch has cleared. Hmm, I would've thought turning it around meant wearing it such that you can no longer tell the time as the clock face is facing your wrist. 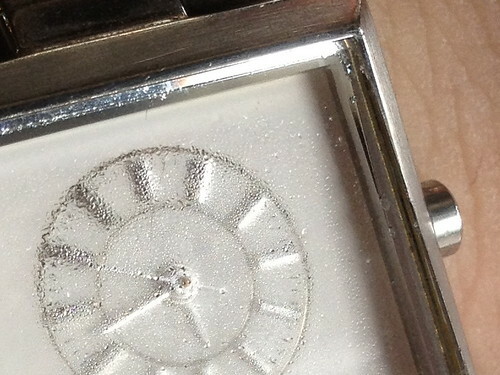 The heat from your wrist on the glass face of the watch would've then caused the water inside to evaporate. Sound logical? Body heat does not emit unilaterally i.e. there should be as much heat coming out from the back of your wrist as much as your front. No? This method is derive purely from an empirical standpoint just like how a bottle of red wine without a deep concave bottom can never be good.